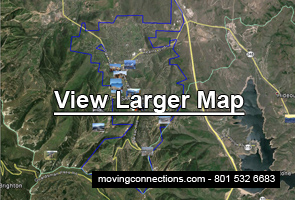 Moving Connections is the choice of so many residents in the Park City, Utah area. This is because we are a professional Park City, Utah moving service with lots of experience in moving families and individuals in this exclusive community. Our top notch Park City, Utah moving crews are experienced professional movers, so they know how to take care of your treasured goods. And Moving Connections is federally licensed. We are also bonded and insured in accordance with federal regulations. So we are a serious moving company with our roots in Northern Utah. We’ve been providing shipping and moving services to local communities for more than three decades. And although we are not a large corporation, Moving Connections is a very professional Park City, Utah moving company. We move anything that you need moved, be it a grand piano or a large gun safe, a piece of exercise equipment or a hot tub. In addition, if you need it, Moving Connections has climate controlled storage spaces available as well as conventional storage areas. If Moving Connections is moving you to Park City it's a perfect time to begin to utilize the many resources and bounties of Park City. For example click on the picture to the left to go the Moving Connections 'Support - Advice - Assistance' page and discover Park City for the first time. Once you are on the 'Support - Advice - Assistance' page go ahead and open the .pdf link found there and tape the list of emergency and useful phone numbers on your refrigerator. Moving Connections has gone to great pains to find those links and connections to integrate you quickly into Park City life. We at Moving Connections are consistently a top choice for Park City, Utah families who want a quality experience in their household moves. And Moving Connections has been providing Park City, Utah relocations for years, and that’s why we can be considered your Park City, Utah local moving service. Moving Connections is a professional moving service with a Federal Motor Carrier Number, which means that we are federally licensed, and we are bonded and insured in compliance with federal regulations. In addition, Moving Connections hires only the most competent and experienced moving personnel to make certain that your goods are handled in a professional way, according to the highest moving industry standards. Your Moving Connections Park City, Utah moving crew will provide the best moving service for a seamless transition for you and your family. You’ll be pleasantly surprised at our competitive and transparent rates: you just pay for labor time and boxes and tape. You don’t even pay for stretch wrap (we use plenty of that) or moving blankets or equipment, no taxes, no surcharges, not even fuel surcharges. Just time and boxes and tape. If you’re looking for a way to save money on your move, or you just like to “do it yourself,” then Moving Connections is your Park City, Utah “Labor Only” moving company. With this service – sometimes called a "labor only moving help" move – you can save money and time by doing much of the packing yourself, and also by providing your own truck and doing your own driving. Moving Connections will just provide the crew to load your truck and to wrap the larger items such as furniture. If you’re planning a Park City, Utah business or office move, then Moving Connections is the Park City, Utah moving service for you. Moving Connections is a local moving service committed to being an affordable alternative to nationally franchised moving companies. We provide a superior moving experience that is unexcelled in Utah. And just as you most likely have decision making protocols in running your business, you should also have some protocols in place for what moving company you hire. First of all, you want to be careful about the personnel your intended moving company hires. At Moving Connections, we employ only personnel experienced in the moving business. And we drug test them. If they fail the drug test, they are rejected. If they don’t have experience in the moving industry, their applications are declined. This helps to ensure that your valued items get to their intended destination safely and efficiently. So when you hire Moving Connections to do your Park City, Utah corporate move, you’re getting a trustworthy crew who knows how to work together smoothly and quickly. Also for your protection, Moving Connections has a federal motor carrier number, and is federally licensed, bonded and insured. Add to that the fact that Moving Connections is committed to providing the best service available for Park City, Utah office and business relocations, and you have the best local Park City, Utah movers in the business. We thrive on our reputation and that’s why we have such a strong presence in Park City, Utah.